Please visit ThyWordIsTruth.com for instructions on how to contact us. Thanks! Enter a query to search our site. Note that you can use "*" and "?" as wildcards. A common misconception about the church of Christ is that “The Church of Christ” is its name. It is not. The “church of Christ” is its description. The church of Christ is the church that belongs to Christ, that was established by Christ, that was built by Christ, and that was bought by Christ. It is not our church; it is His church, the Lord’s church. We are not voted into the church by men, and we do not join a church the way some might join a country club. Instead, God adds us to His church when we obey His gospel. Thus, the real question is not what is the church of Christ, but is rather how do you become a part of the church of Christ? That question was asked in the first century as it is asked today, and the answer remains the same. We are saved and added to the Lord’s church when we obey the gospel of Jesus Christ. Like the Apostle Paul, we are saved when our sins are washed away at our baptism. There is one church of Christ. If you are a member of something else or something more or something less, then you are not serving God according to His plan or according to His will. He wants you to be a Christian and only a Christian, wearing only the name of His Son, Jesus Christ, who is the head and the savior of the church, His body. What must I do? That same question was asked in Acts 2:37 at the end of the very first gospel sermon ever preached. Before we look at Peter’s answer in verse 38, let’s look at some answers Peter did NOT give. What must I do? John Calvin answers, “Nothing!” According to Calvin, there is nothing we must do and nothing we can do. Each of us has already been personally predestined to Heaven or Hell without regard to anything we do on Earth, and so, logically, according to Calvin, the only answer to the question in Acts 2:37 is “Nothing.” But that is NOT how Peter answered that question. What must I do? Many preachers today answer, “You must make Jesus the Lord of your life.” But that answer makes absolutely no sense then or now! Peter had just said in Acts 2:36 that “God has made him both Lord and Christ, this Jesus whom you crucified.” Jesus was already Lord of their lives! Jesus is Lord of lords and King of kings, which means he is your Lord and your King whether or not you obey him or believe him. We obey Jesus because he is Lord and King – not to make him Lord and King. What must I do? Many preachers today answer, “You must pray the sinner’s prayer and invite the Lord Jesus into you heart.” But no one in the Bible was ever told to do that. In fact, Paul prayed after he saw Jesus on the road to Damascus (Acts 9:11), and yet Paul was still in his sins when Ananias met him three days later (Acts 22:16). Cornelius prayed to God always (Acts 10:2), and yet there remained something he still had to do after calling for Peter (Acts 10:6). If praying the sinner’s prayer was all that Paul and Cornelius needed to do, then why were Ananias and Peter needed? Want to know more? Here is God's Plan of Salvation. In verse 20, Jesus says, “But I have this against you, that you tolerate... .” The modern reader recoils at that sentence — how, they ask, can anyone be too tolerant? Tolerance, after all, has become the greatest virtue in our society. Leslie Armour, a philosophy professor at the University of Ottawa, has said that “a virtuous citizen is one who tolerates everything except intolerance.” The United Nations Declaration on the Principles of Tolerance states that tolerance involves the rejection of dogmatism and absolutism. Thus, according to the UN, if you believe dogmatically in anything or if you believe anything is absolute, then you are by definition intolerant and worthy of rebuke. We see in these verses how Jesus views tolerance, and not surprisingly it is quite different from how tolerance is viewed by the world. The church of Christ must be intolerant whenever Christ is intolerant, and the Bible tells us what we must never tolerate. Note that verse 23 says that Jesus’ message is a warning to all the churches. The messages in these letters apply to all congregations. Jesus says in verses 26-27 that at this time he possesses power and authority over the nations. Verse 26 says that we will share this power. When? When will we share in that power? We already do! 1st Corinthians 3:21–23 says that the world and all things are ours. Romans 5:17 tells us that we are now reigning in life through Jesus. This book is evidence that the early Christians already had power over nations because (as we will see later in the book) it was their prayers for vindication that caused God to topple the mountain of Rome. Why then did Jesus promise them something they already had? Often a promise is simply an assurance that a present blessing will continue. Jesus’ promise here means that the blessing will continue, be renewed, and be strengthened. This idea is also indicated by the promise of the morning star in verse 28, which symbolizes a fresh start, a renewal of peace, a resurrection. Although they were reigning with Christ now, that reign with Christ would be clear to all after their victory over Rome. They would soon experience new circumstances, something we will see beautifully unfolded as we progress toward the end of this book. What is the lesson to the church from Christ’s letter to Thyatira? Look at verse 20. The lesson for the church today is that we must not be tolerant with regard to departures from the word of God. The world may see tolerance as the greatest virtue, but Jesus does not share the world’s opinion. His first criticism of this congregation was that they tolerated a false prophetess. We, of course, should be very tolerant on matters of opinion as discussed in Romans 14, but on matters of the faith, we must never be tolerant of departures. We must never tolerate sin. Toleration is no virtue when we tolerate that which Jesus hates! Sardis was really two cities. The original city stood 1500 feet up on a hill in a position that was almost impregnable. Later, the city spread to the foot of the hill as well. Thus, Sardis was really two cities – one on the hill and one at the foot of the hill. Sardis has been called the greatest example of the contrast between past splendor and present decay. Sardis was now a city of degeneration, but 700 years before John, Sardis was one of the greatest cities in the world. The city, as had the church within, had by the time of Revelation lost its life and its spirit. The city had been destroyed by an earthquake in AD 17, but was rebuilt by Tiberius. The congregation in Sardis had a reputation. It had a reputation among men of being alive. No doubt it was considered very progressive and contemporary. It was most likely very well regarded in the community. It may have been very fashionable to be a member of the congregation in Sardis. But where men saw a thriving church, God saw an empty shell. In verse 2, Jesus told them that their works were not right in the sight of God. And if your works are not right in the sight of God, it does not matter how your works look in the sight of man. In fact, when the world has nothing but good things to say about you, it should be a warning that you have become too much like the world. Luke 6:26 Woe to you when all men speak well of you, For so did their fathers to the false prophets. Jesus had a message for Sardis. He told them in verse 2 to “Wake up and watch!” and in verse 3 he said he would come as a thief. This message had some historical significance to the city of Sardis. Cyrus of Persia has once besieged the city and had offered a reward to anyone who could find a way to enter the city. A soldier, who had seen a Sardian soldier climb partially down the hill to retrieve a lost helmet, led a group up the hill following the same fault line at night. They discovered the battlements completely unguarded, and they took the city. The church in Smyrna was at peace and that peace had allowed them to drift into a coma and nearly die. They were resting in peace! And that is a danger we must avoid today as well. Christ brought us peace with God — not peace with the world. We are never told to be at peace with worldliness. 1 Peter 2:11 says that a Christian is always at war. In Ephesians 6:14–17 we find that a Christian is always dressed for battle. Too many Christians have made peace with the world! In verse 1, Jesus says, “I know your works.” Jesus is not only interested in our works, he knows our works. We are not saved by our good works (Ephesians 2:8-9), but neither will we be saved if we have no good works (Ephesians 2:10). “Every good tree bears good fruit” (Matthew 7:17), which means that if we are not bearing good fruit, then we are not a good tree. In verse 5 we find that one’s name can be blotted out of the book of life. What does that say about the doctrine of “once saved—always saved”? It tells us it is a false doctrine. If my name can be in the book of life and then be blotted out of that book, then I can be saved and later lost if I fail to be faithful to Christ. What is the lesson to the church from Christ’s letter to Sardis? Look at verse 2. The lesson for the church today is that we must remain watchful. As soon as we say that such and such would never happen to us, Satan sees his opportunity. We have just announced to him a part of our defenses where we have no guards, and he will seek to take advantage of that weakness. 1 Corinthians 10:12 Therefore let him who thinks he stands take heed lest he fall. Satan will always attack us at our weakest point, and our weakest point is usually the point where have no defenses, such as the unguarded battlements of Sardis. Watch! Philadelphia was the youngest of the seven cities. The city was founded by colonists from Pergamum sometime between 159 and 138 BC to be a missionary city of Greek culture to the Lydia. And it worked! By AD 19, the Lydians had forgotten their own language and were all but Greek. For a time, the city was constantly beset by earthquakes and tremors, and most of the people lived outside the city in huts. Jesus tells them in verse 12 that they would go out no more. The name of the city was changed to Neocaesarea and later to Flavia, but neither name lasted and the name Philadelphia was eventually restored. Jesus tells them in verse 12 that they would receive a new name. In verse 8, Jesus says that an open door had been set before them. In the Bible, an “open door” is an opportunity for service and evangelism. 1 Corinthians 16:9 For a great and effective door has opened to me, and there are many adversaries. Colossians 4:3 Meanwhile praying also for us, that God would open to us a door for the word. 2 Corinthians 2:12 Furthermore, when I came to Troas to preach Christ’s gospel, and a door was opened to me by the Lord. Jesus’ promise in verse 10 to keep these Christians did not necessarily mean they would be spared from suffering. In Ezekiel 9:1–8 God promised to keep his people, yet in Ezekiel 21:3–4 they experienced suffering and death. God provides spiritual deliverance. Once again we need to see things the way God sees things — we need spiritual eyes and a spiritual perspective. In 2 Chronicles 7:16 God said he would put his name on the literal Jerusalem forever yet here in verse 12 he puts his name on the new Jerusalem. The words “forever” and “everlasting” must be read in context and carefully studied to determine their proper subject. Many “everlasting” promises are conditioned on faith, and thus will be everlasting only so long as the condition is satisfied. Other eternal promises are directed to the faithful whether it be the faithful people of God in the Old Testament or the faithful people of God in the New Testament, the new Jerusalem. And I will give to you, and to your descendants after you, the land of your sojournings, all the land of Canaan, for an everlasting possession; and I will be their God. Yet in Matthew 21:43 Jesus said that the unbelieving Jews no longer had an inheritance. Both he that is born in your house and he that is bought with your money, shall be circumcised. So shall my covenant be in your flesh an everlasting covenant. Yes in Philippians 3:3 we find that true circumcision is not of the flesh. And their anointing shall admit them to a perpetual priesthood throughout their generations. Yet in Hebrews we find that Jesus is our perfect high priest. And this shall be an everlasting statute for you, that atonement may be made for the people of Israel once in the year because of all their sins. Yet Hebrews tells us that Christ is now our once for all time, prefect atonement. What does it mean in verse 12 to write these three names on a Christian (the name of God, the name of the city of God, and the name of Christ)? Christians belong to God. Christians are citizens of the church (the new Jerusalem). Christians belong to Christ. They have a special relation with Christ. God claims us as his own special people when he writes his name on us. Later in this book we will see people with someone else’s name written on them. We will also find that Christians are pictured as having the name of the Lamb and of the Father written on them to distinguish them from those opposed to Christ. I have made the point before that the “church of Christ” is our description, not our name. That is why we write “church” with a lower case “c” (despite the ridicule and the scorn that often accompany it). We are the church that belongs to Christ – the church of Christ. He has written his name on us! The story was told of a large, prominent denomination in town that was raising money from community businesses to build a new building. They approached a business man who was a Christian, and he made them an offer. “I will give you $1000 if you put up a sign in front saying ‘This is a church of Christ.’” “We can’t do that,” they said, “this is a _ church” (where the blank was filled in with the name of a local denomination). “Well,” the Christian business man responded, “I’ll still give you a $1000 if you will put up a sign saying ‘This is NOT a church of Christ.’” When you understand that story, you understand the non-denominational nature of the church! It’s really not that hard. We belong to Christ Jesus, and Christ Jesus has written his name on us! Verse 8 tells us that they were very weak, and verse 9 tells us they faced fierce opposition – and yet Jesus himself had opened a door for them – and he expected them to go through it! Woe to us when Jesus opens a door and we fail to go through it — and we are surrounded by open doors! The church was weak in influence compared to its Jewish opposition. The synagogue of Satan is mentioned again in verse 9. We need to understand that Satan is real and he is actively working against us. Satan is mentioned six times in these two chapters. That alone should tell us something important. Jesus knows that Satan is real and that Satan is active. Jesus recognizes that his church is facing a vicious adversary, and he is giving us a warning. 2 Corinthians 2:11 Lest Satan should take advantage of us; for we are not ignorant of his devices. 1 Peter 5:8 Be sober, be vigilant; because your adversary the devil, as a roaring lion, walketh about, seeking whom he may devour. The New Jerusalem in verse 12 is the church. In place of the old city of Jerusalem where the people of God once dwelled, there is now a new Jerusalem where the people of God now dwell – and that New Jerusalem is the church. Notice that the New Jerusalem comes down out of Heaven from God. As Daniel told us in Daniel 2, Jesus tells us here that the church is not a product of man. It is the eternal kingdom not made with human hands. It was created and established by God. What is the lesson to the church from Christ’s letter to Philadelphia? Look at verse 8. The lesson for the church today is that we need to look for open doors for service and evangelism. We need to pray for such opportunities, and then we need to take advantage of those opportunities when our prayers are answered. John will find himself standing before an open door in 4:1! Laodicea was the only congregation about which Jesus had nothing good to say about their present condition (although he did say in 1:19 that he loves them and he suggested in 1:21 that they could still conquer if they repented). Doesn’t it tell us a lot about our Savior that he saved this letter for last? He had nothing good to say, and so he was not in any hurry to get to them. He wanted to have something good to say about them! Some teachers love to give failing grades, and others hate to do so. Jesus is in the second category. Ezekiel 33:11 Say unto them, As I live, saith the Lord GOD, I have no pleasure in the death of the wicked; but that the wicked turn from his way and live: turn ye, turn ye from your evil ways; for why will ye die, O house of Israel? The city was founded in 250 BC by Antiochus and named after his wife. It was positioned on the most important road in Asia, which connected Ephesus to Syria. This road made the city a great commercial and strategic center. The peace provided by Rome allowed Laodicea to flourish. Laodicea was proud and felt that it had need of nothing. When the city was destroyed by an earthquake in AD 61, the people refused Roman help and rebuilt the city on their own. It was one of the wealthiest cities in the world and was a center of banking and finance – yet Jesus told them they were poor. The city was a center of clothing manufacture and was famous for its soft, violet-black, glossy wool – yet Jesus told them they were naked. The city was a medical center and housed a medical school that was famous for its ointment for the eyes and ears – and yet Jesus told them they were blind. This congregation was proud and contented – and Jesus did not have a single good thing to say about them. Those in Smyrna were destitute, and Jesus told them in 2:9 that they were rich. These people in Laodicea were rich, and yet Jesus tells them that they are destitute. How often is the truth just the opposite of what men believe? Proverbs 13:7 There is that maketh himself rich, yet hath nothing: there is that maketh himself poor, yet hath great riches. Once again we see a familiar theme of this book. We must see things as God sees them, and to him sometimes the poor are rich and the rich are poor! The beginning of the creation in verse 14 is the source of the creation. Jesus is God. He was not created. Nowhere in the Bible are we ever told to worship any part of God’s creation, yet we are told to worship Christ. Jesus is the source of all creation. See Hebrews 1:2, John 1:1–3, and Colossians 1:16. In verse 16, Jesus says he will spew these lukewarm Christians out of his mouth! They deeply offended Christ! Some suggest that this metaphor comes from the water supply of the city, which was lukewarm, in contrast to the hot springs at nearby Hierapolis and the pure water of Colossae. The archaeology shows Laodicea had an aqueduct that probably carried water from hot mineral springs some five miles south, which would have become lukewarm before entering the city. Other suggest that the imagery of the Laodicean aqueduct suggests not that “hot” is good and “cold” is bad, but that both hot and cold water are useful, whereas lukewarm water is useless. Perhaps (even though I can think of some uses for lukewarm water), but the Greek word used for “hot” (which occurs only here) is zestos, which has the same root (zeo) as the Greek word for “fervent.” We are told elsewhere of those who were fervent in spirit (Acts 18:25, Romans 12:11), which suggests to some (and to me) that the word “hot” is used here to denote a spiritual condition. Similarly, the use of “cold” reminds of Matthew 24:12 ― “And because iniquity shall abound, the love of many shall wax cold,” although the Greek word used here is different and appears elsewhere only in Matthew 10:42 where it describes a cup of cold water. In short, if “hot” denotes a spiritual condition, then it would seem that “cold” must also denote a spiritual condition, and a cold spirit would seem to be the opposite of a fervent spirit. Verses 15-16 tell us that Jesus prefers hot or cold to lukewarm! We might be tempted to think that a cold Christian would be worse than a lukewarm Christian, but not according to Jesus. At least the cold Christian has made a decision – it was the wrong decision, but at least he has acted. The cold Christian has left the church. But not so with the lukewarm Christian. They hang around and cause all sorts of trouble. The lukewarm Christian was then and is now the curse of the church. How often has the “hypocrites in the church” argument been used as an excuse against the gospel call. A lukewarm Christian is not actively against Christ — instead, his carefree attitude shows no concern for Christ, and he does great damage to the Lord’s body. Were these people without hope? Not at all. Verse 19 tells us that Jesus wanted them to repent. Verse 20 pictures Jesus as standing at the door of his own church and knocking. He wanted to be let back in to his own church! We can look to the denominational world for an example of hot, cold, and lukewarm. In the recent vote to ordain a gay bishop in the Episcopalian religious group, some voted yes and some voted no. But did you notice that there were also two abstentions? I have more respect for those that voted yes! You must note that in this last message to the Laodiceans, he has not a word of praise for them—not a word of praise. Almost all the rest have some praise given them, but there is not a word of praise for these halfhearted Laodiceans. They want to go comfortably on, and not to be troubled much, and they will get into heaven as they please, in some sleepy way or other. They won’t find themselves comfortable there. It is not the halfhearted, simmering kind of hearts that the kingdom of God and His Christ is for. Had God been halfhearted you would never have had a chance of life eternal. It is because God is true-hearted, unselfish, out and out devoted to His creatures that there is any world at all. And He won’t have you as you are! If you correspond at all to this description of those that made up the church of the Laodiceans, God won’t have you—you won’t do! What a word of indignation this is! Oh! you are quite wrong if you have the fancy that Jesus Christ is one who is always speaking soft words. He is indignant sometimes, He is angry sometimes, but there is not one atom in that indignation, in that anger that is not love. But His love will not make His blow lighter, and you are afraid of that kind of love because it demands so much. It demands that you shall be fit to come into His very arms, to His very heart, and less than that will not do. It cannot be that He shall embrace evil things; He will have us free, cost what it may; if it takes an eternity to clean us, we must be clean. Neither cold nor hot: What a word almost of contempt! Only there is no contempt in Him. Using our language it sounds like it, but I call it “indignation,” and the strong effort of His heart of love to make them feel what a low condition they are in. “Neither cold nor hot—I won’t have you; I will spew you out of my mouth.” That Christ should speak like that to us and we deserve it—who will endure it? But, oh! it is of the mercy of God that He speaks to us like that. He speaks very plainly what He thinks of them, and He shows very clearly how His thought about them ran counter altogether to their own judgment of themselves. “Oh, we are all right! We accept this and that doctrine; we believe so-and-so; we are all right.” Or, on the other hand: “We have broken free from the traditions of the elders; we have got a better way, and so we are all right.” Are you doing the things that Jesus Christ tells you? If not, you are all wrong. Your ideas, your opinions, your systems, let them be as correct as astronomy, and you are no better, but probably much the worse for them. Does the Lord say this for the sake of abuse? No; He wants to rouse us—“I counsel thee”—He wants to rouse us up, to open our treasure houses that He may fill them, to open doors and windows that the breath of God may blow through our souls. That is why He says the hard words, but hard words in the right places are the kindest thing. What is the lesson to the church from Christ’s letter to Laodicea? Look at verse 15. The lesson for the church today is that Christ will not have us if we care nothing for him or for his church. He would rather us be actively opposed to him than for us to say we are on his side and yet live a life of total indifference to his will. His message to this congregation was to get off the fence! Make a decision one way or the other! Don’t just sit there! Act! So where are we at the end of Chapter 3? What is next for John? The letters to the seven churches are complete. Each was challenged to overcome. The situation looks bleak at this point in history. The church seems unable to resist the hostile worldly powers that surround it. But, history is not determined by political powers. As we are about to see, history is determined by God. The question now is, what will be the fate of God’s enemies and what will be the fate of God’s people? Satan, as usual, will try to thwart God’s will, and Satan’s goal as always is to extinguish the church. But with regard to Rome his time is short! Revelation 12:12 Rejoice then, O heaven and you that dwell therein! But woe to you, O earth and sea, for the devil has come down to you in great wrath, because he knows that his time is short! The book of Revelation is a book of judgment. In the first part of the book, Christ pronounces judgments against the church’s enemies from within. In the second part of the book, Christ will pronounce judgments against the church’s enemies from without. What comparisons can we see between these two judgments? In each case, Jesus tells his listeners that the way they see themselves is really the opposite of the way they really are! One church thought it was rich, Jesus said they were poor. One church thought it was poor, Jesus said they were rich. Rome thought it had all the power, Jesus will tell them that they are powerless. Rome thought the church was of no consequence, Jesus will tell them that the church is infinitely more important than Rome. There is a message in here for us as well. To see ourselves correctly, we must see ourselves as God sees us, and the best way to do that is it see ourselves through the word of God. As scarce as truth is, the supply has always exceeded the demand. Jesus likely gave some of these people more truth than they wanted! They no doubt did not enjoy seeing themselves through God’s eyes. They would much rather have heard pleasant things from Christ, but Christ told them the truth, which is what they desperately needed to hear. • Jeremiah 5:30–31 An appalling and horrible thing has happened in the land: the prophets prophesy falsely, and the priests rule at their direction; my people love to have it so, but what will you do when the end comes? • Isaiah 5:20 Woe to those who call evil good and good evil, who put darkness for light and light for darkness, who put bitter for sweet and sweet for bitter! How do we find out today what we need to hear? We quit listening to man and the world, and we start reading God’s word. He has told us all that we need to hear. Our job is to listen to that message and then to heed that message. One final comment about the seven letters — each of them begins with the same phrase: “I know.” We understand that Jesus is the head of the church, but sometimes we act like he is a distant monarch. These letters paint a very different portrait of our king. Jesus is intimately concerned about his church. Indeed, the Bible describes the church as the body of Christ and as the bride of Christ. Jesus knows what is going on in his church, and he cares very deeply about what is going on in his church – and that should be a great source of comfort for us today when the church seems to be in such turmoil all around the world. Does Jesus care? Yes, he cares. I know he cares. Jesus knows what is happening in his church. We should all pause for just a moment to thank God that Heaven has a door and that Heaven’s door is an open door! Jesus Christ opened that door for us! In this chapter, God draws aside the curtain of Heaven and gives to John a vision of the majestic throne of the Ruler of the Universe. This voice in verse 1 is the same voice that John heard in the first vision, which means that this is possibly the voice of Christ (which John heard in 1:17-20), although others say it is the voice of the angel that they contend was the one speaking in 1:11. John is invited not just to look in through the door but to enter through the door. John was not the last person to be presented by Christ with an open door. We are given open doors of opportunity every day, and we need to follow John’s example. We have already been told that the things that “must take place” would occur soon (see 1:1 and 1:3). So once again, at the very beginning of this second vision, we are reminded of the all important time frame for this book. The phrase “after this” is similar to what we saw in 1:19 where John was told to “write what you see, what is and what is to take place hereafter.” “This” refers to what John had just seen, and “after this” refers to what he was about to see. 2 At once I was in the Spirit, and lo, a throne stood in heaven, with one seated on the throne! 3 And he who sat there appeared like jasper and carnelian, and round the throne was a rainbow that looked like an emerald. How then could John have seen God? The answer is given in the opening part of verse 2 – John “was in the Spirit.” He was experiencing a spiritual vision just as had been experienced by Isaiah and Ezekiel, just to name two other examples. John was not seeing God with his physical eyes but rather with his spiritual eyes. 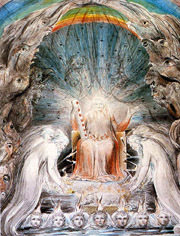 John not only sees the throne, but he sees the one seated upon the throne. 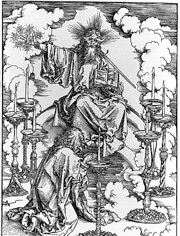 Ezekiel described the occupant of the throne in Ezekiel 1:26 as having “a likeness as the appearance of man,” but John portrays no form. The throne of God is mentioned 40 times in this book (17 times in Chapters 4 and 5), and the message is clear — the throne that rules the world is not in Rome. This vision begins with a clear depiction of the absolute sovereignty of God. All things must be viewed with regard to their relation to the throne of God. What about the stones mentioned in verse 3? Jasper is a translucent rock crystal. Carnelian is a blood red stone that is also called sardius after the city of Sardis where it is found. In Exodus 28:17, these stones are in the breastplate of the high priest. Perhaps the white jasper represents God’s holiness and righteousness, while the red sardius denotes his judgments. This view would fit nicely with Psalm 89:14, where we read that righteousness and judgment are the foundation of God’s throne. To the literalistic mind, lacking the power of imagination, Revelation will forever be a sealed book; to the speculative and visionary mind the book will provide fuel to inflame far-fetched assumptions and conjectures which totally miss the truth. But to the mind prepared by the rest of the Bible for reality in picture and action, impressions of truth will be made that give strength for victory in every conflict of life. As in the parables, many of the minor details are likely merely descriptive and are not intended to carry a special significance of their own. Here the details serve to paint a picture of beauty and majesty. Later we will find pictures of horror and death. Remember that John was standing before the throne of God! Do we really think he was puzzling over why the stones were white? The rainbow reminds us of God’s mercy and that he keeps his covenants. A similar description is used in Ezekiel 1:28. Like the appearance of the bow that is in the cloud on the day of rain, so was the appearance of the brightness round about. Such was the appearance of the likeness of the glory of the LORD. And when I saw it, I fell upon my face, and I heard the voice of one speaking. At ThyWordIsTruth.com, you will find 1000's of pages of detailed class notes and 100's of hours of audio lessons on a variety of Bible books and Bible subjects. We have 7 lessons on the prophecies of Daniel. How is Daniel related to Revelation? What are the 70 weeks? What is the abomination of desolation? We also have 24 lessons on First Corinthians. In this epistle, Paul deals with many current issues facing the church both then and now: immorality, divorce and remarriage, the role of women, spiritual gifts, the importance of love, and the resurrection of the body. We have 25 lessons on Second Corinthians. In this epistle, Paul continues to deal with problems facing the church in Corinth, which now include an influx of false apostles who are belittling Paul and demeaning his apostolic authority. We have 13 lessons on the books of First & Second Peter. Were those books written by Peter? Was Peter the first pope? Why were those books written? Are false teachers still a problem today? We also have 23 lessons on the book of Romans. These lessons take you on a verse by verse study of what many consider to be the most beautiful book in the Bible. We have 25 lessons on the book of Ezekiel. These lessons take you on a verse by verse study of this fascinating but often neglected book from the Old Testament. We have 11 lessons about Elijah and Elisha. These notes provide a verse by verse study of 1 Kings 16 through 2 Kings 13, as well as a lesson about the role of Elijah in the New Testament. We have 13 lessons on James and Jude, the two letters written by the earthly (half)-brothers of Christ. They have much to tell us about the Christian life and how we are to contend for the faith in a godless world. We have 25 lessons on Thought Provoking Questions with over 500 pages of detailed class notes and special handouts. Topics include: Marriage & Divorce, Baptism, The Role of Women in the Church, End Times, Mormonism, Social Drinking & Gambling, Instrumental Music, The Lord's Church, Evolution & Intelligent Design, Forgiveness, the Holy Spirit, the Afterlife, Secular Humanism, Premillennialism and the Rapture, The Restoration Movement, Alleged Contradictions in the Bible, The Christian and the Law, Time and Chance, The New Hermeneutic, God and Politics, Jehovah's Witnesses, Islam, and Muhammad. © Copyright 2010 ThyWordIsTruth.com. All Rights Reserved.